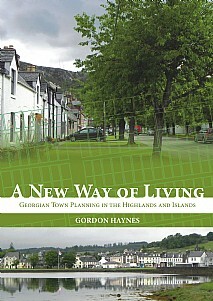 A New Way of Living tells the broad story of the development of new towns in the Scottish Highlands and Islands post-1750. It pulls together the various strands that influenced the development of the North West Highlands after the disastrous risings and charts the government-backed attempts at establishing fishing villages from Argyll to Sutherland, as well as private initiatives to do likewise along the shores of the Moray Firth. Old harbours were improved and new ones created in an attempt to capitalise on the rich but fickle fishery resource of the continental shelf, many engineers making their reputations in the process. Roads and later railways were built to connect these new settlements to their markets which were tens or hundreds of miles away across mountain ranges, presenting monumental challenges for the designers and workforce. In the farming country of Morayshire, north Aberdeenshire and the old counties of Banffshire and Buchan, landowners led these improvements, often bestowing their names on their villages and towns such as Archiestown and Macduff. The entire programme, which came to a faltering close in the 1830s, was designed to increase the profitability of estates and improve the wealth and health of the population by bringing law, order and civilisation to what was previously a scattered population with very limited access to modern services and amenities. In many cases the plan succeeded although there were some notable failures and many misguided enterprises, the consequences of which left fledgling communities high and dry without any viable industry. This was a period when a new way of living was imposed upon a population that had no alternative but to accept it or leave for the colonies. The book demonstrates how the planners borrowed concepts from history and how the more successful layouts were developed with some degree of building regulation applied to a sensibly zoned plan. Many of the places studied, particularly those on the coast, are now sought-after as holiday home locations, thus proving the enduring appeal of picturesque settings of terraced cottages clustered around a harbour or bay. The rationale for their existence may have changed but the constant appeal of the plan and building fabric of many of the new towns illustrates the enduring worth of this Georgian legacy. Architects, town planners and surveyors including students, academics and enthusiasts in landscape architecture, social and urban history will all find this book of especial interest.